This research is conducted in the Malaysian corporate setting with the presence of favoured companies or politically connected companies (PCON). PCON companies are perceived by the market and external auditors to be riskier than non-politically connected companies. In addition, these companies generally exhibit poor corporate governance practices and face agency problems. However, the enforcement of tighter regulations and the greater emphasis on risk management and governance practices within the PCON companies further indicate the growing importance of having a strong audit committee and internal audit functions in fulfilling corporate governance responsibilities. With reference to the findings from the interviews with the regulators, external auditors and internal auditors, the audit committee and the head of internal auditors of PCON companies have been complying with the Bursa Malaysia Listing Requirements, which were revised in 2008. This observation strengthens claims that the corporate governance regulatory framework has indeed been effective. The involvement of the audit committee and internal audit functions in strengthening internal controls demand higher audit quality from the external auditors, and, hence, higher audit fees. NORZIATON, I. K.; DEVI, S. Susela; MENG, Chan Wai. 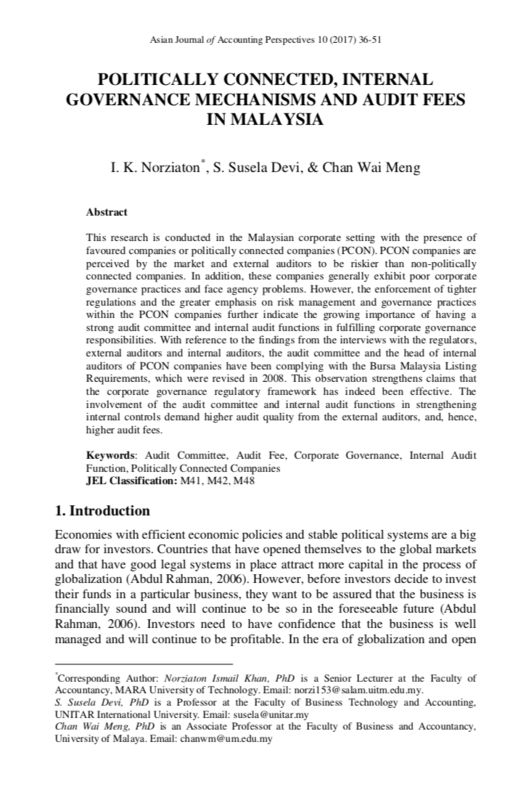 Politically Connected, Internal Governance Mechanisms and Audit Fees in Malaysia. Asian Journal of Accounting Perspectives, [S.l. ], v. 10, n. 1, p. 36-51, dec. 2017. ISSN 0128-0384. Available at: <https://ajap.um.edu.my/article/view/11279>. Date accessed: 20 apr. 2019.